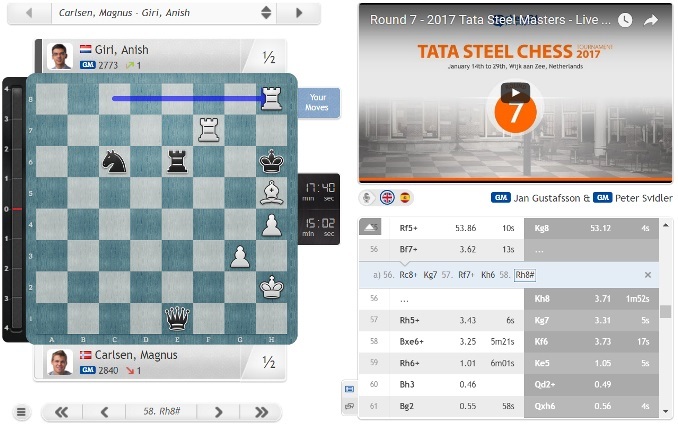 Tata Steel 2017, 7: Magnus’ most embarrassing moment? 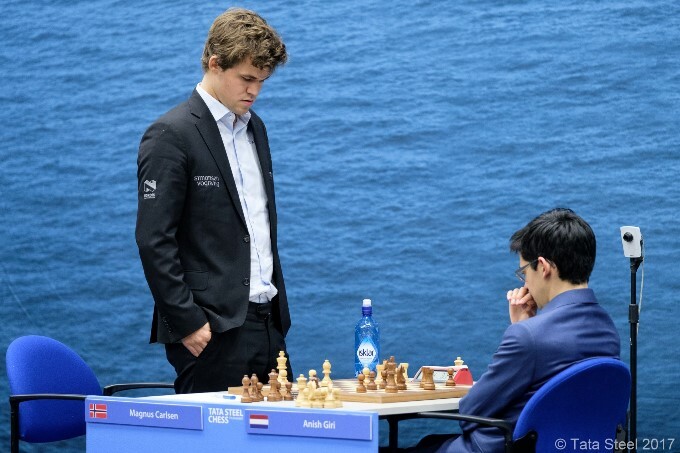 World Champion Magnus Carlsen missed what was mate-in-3 or instant resignation on his way to a 123-move draw against his erstwhile nemesis Anish Giri, who called it “the most embarrassing moment” of his opponent’s career. 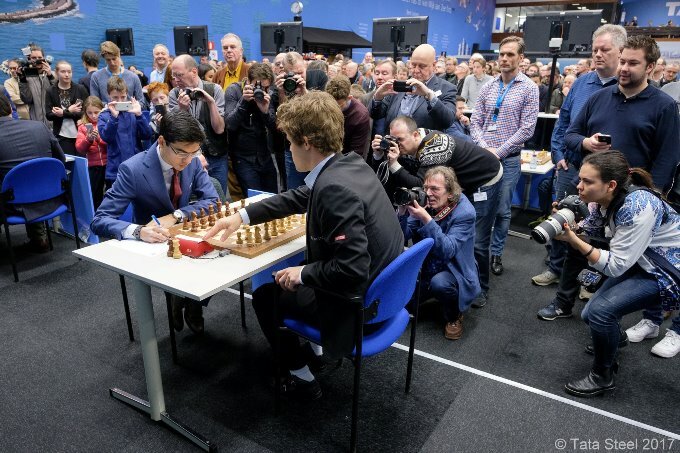 Remarkably, though, that arguably wasn’t the oversight of the round, since Levon Aronian and Sergey Karjakin both missed an immediate win on move 11. To cap it all, Wesley So reached 50 games unbeaten, Wei Yi slayed another Sicilian, Adhiban’s revival continued in bizarre fashion and Dmitry Andreikin began a game 1.c3. What a day! Adhiban’s revival continued with a second win in a row with the black pieces against a top player, but to say there were twists and turns would be an understatement. Radek Wojtaszek won the opening battle and it seemed just a question of when he would coordinate his pieces to push for a win. Instead, he let Adhiban plant a rook on the 2nd rank and take over the initiative. 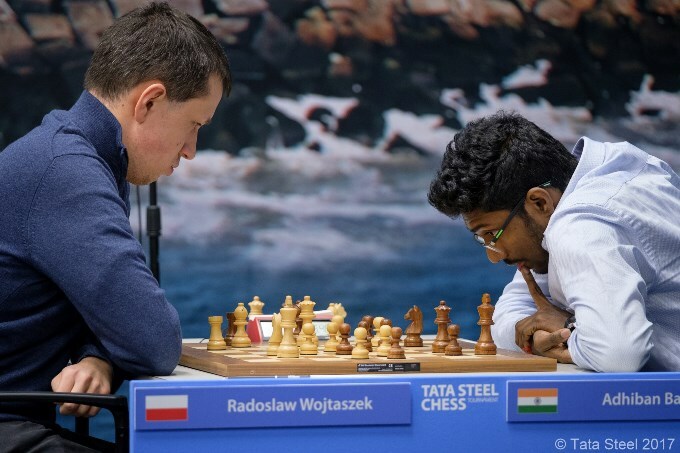 If Black had converted that advantage it would have been a common story, but instead the game swung back in Wojtaszek’s favour, until he again let the edge slip and then committed hari-kari. 48.c7? !, giving up a piece, was by no means necessary. After 48…exf2 49.Kxf2 Ba6 it was Black in the driver’s seat. Radek might still have saved himself in a study-like fashion, but the game had no more twists. Adhiban’s soaring self-confidence had paid off again! 5. Loek van Wely spends 50 minutes on 13…Nc5? One of the mysteries of world chess is why people keep on testing 17-year-old Wei Yi in the open Sicilian. 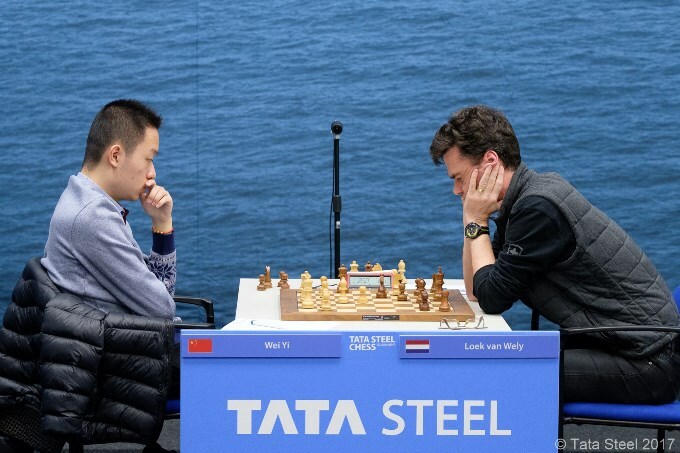 In Wijk aan Zee he’d already smashed Ian Nepomniachtchi in the Najdorf, but Loek van Wely, as so often in his career, walked straight into the lion’s den. 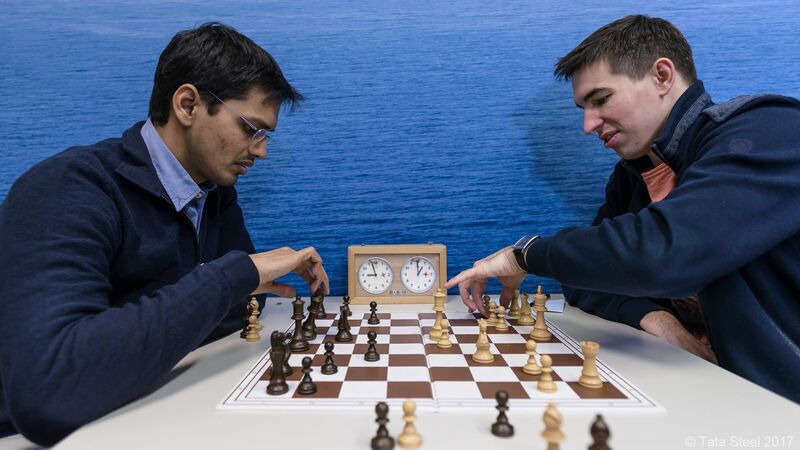 Once again, this position had been seen six times, including in Adhiban ½-½ Swiercz from the 2014 Biel Open. Everyone with Black had played the natural 13…Kf7, but this is where Loek sunk into even deeper thought, spending over 50 minutes to come up with... the losing novelty 13…Nc5? …he ultimately showed endgame prowess to bring the encounter to its logical conclusion. Richard Rapport played 1.b3 earlier in the tournament, Adhiban of course went for the King’s Gambit, but Andreikin’s 1.c3 still stands out. It’s not every day you manage to make your opponent think for over 3 minutes on move 1! Statistics back up Harikrishna’s surprise. According to the chess24 database (in the “Opening Tree” and “Database” tabs below the live broadcast) 1.c3 is the 14th most popular opening move. The highest rated player ever to have played it before Andreikin seems to be Ian Rogers, who had a 2624 rating in 2007 when he beat James Morris (2330). The Australian grandmaster hasn’t just tried it against weaker opponents, though, essaying it (unsuccessfully) against Viktor Korchnoi in the 1982 Lucerne Olympiad – one of those moments you’d like to have seen the great man’s face! Another game that stands out is Vlastimil Hort (2605) 1-0 Pia Cramling (2405) from Biel 1984, but as you can see, it’s not a run-of-the-mill occurrence! The rest of the game failed to live up to that early interest. After 1.c3 e5 the players were in a reversed Caro-Kann where White had an extra tempo, and although Harikrishna gained some advantage it was so slender that the slightest inaccuracy was enough to see it slip away. Draw in 43 moves. On another day this would be the story, since Wesley So remained unbeaten since July 16th, 2016 and has now notched up a half century of unbeaten games. 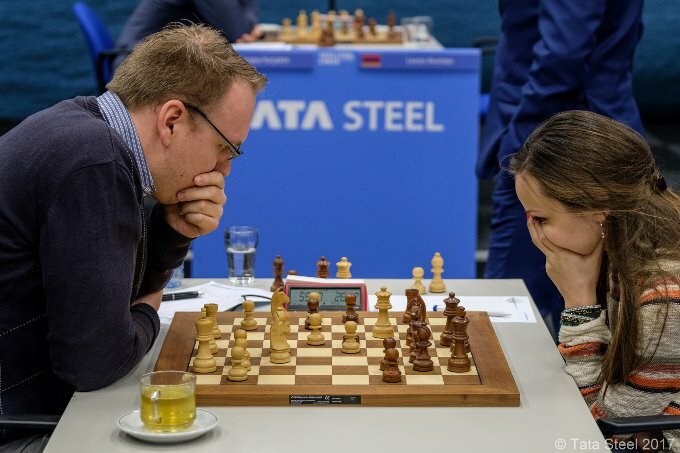 It hasn’t all been plain sailing, with Rapport missing an open goal against So in Round 3, while in Round 7 Pavel Eljanov almost pulled off a brilliant win, starting with 24…h5! Sergey Karjakin then spent over 9 minutes – possibly the longest 9 minutes of Aronian’s life if he’d seen what he’d done – before playing the “natural response” 11.d4?? That takes advantage of the undefended bishop on e6, but instead Karjakin could have played 11.c4! Ndb4 12.c5! and White is simply winning a piece. Black can claim some compensation, but our commentary team felt that immediate resignation would have been a perfectly valid option. That would have won the memorable moment of the round on any other day, but on Saturday it couldn’t quite compare to the World Champion’s game. 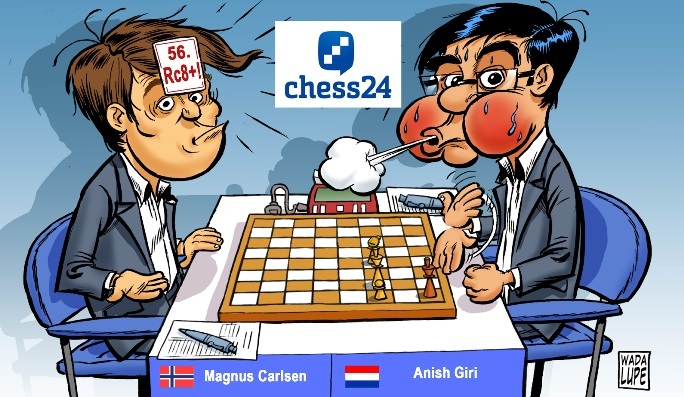 Magnus Carlsen finally ended his Anish Giri curse in Bilbao last year, winning a game to level their career score. Then in Wijk aan Zee it looked as though he might finally move into a plus score against his arch rival. 56.Rc8+! is essentially mate-in-3, since 56…Re8 or 56…Nd8 are both equivalent to resignation. The mate is simple, when you see it: 56…Kg7 (or 56…Kh7) 57.Rf7+ Kh6 58.Rh8# In fact, it’s almost how Carlsen ended the World Championship match in New York! 60…Qd2+! 61.Bg2 Qxh6 62.Rxc6 and as the endgame tablebases helpfully informed us, the position is a mathematical draw. Anish wasn’t going to let the draw slip from his grasp, rendering the remaining 60 moves less than absolutely necessary. That was about all the comfort he could take, though, since Giri was clearly enjoying himself! He’s a very, very strong player, and if he’s at his best he’s impossible to deal with, but against me he just does it all by himself. He outplayed me many times, but he has difficulty… I don’t really know why, but it’s his problem! The Challengers, in comparison, was something of an oasis of sanity. 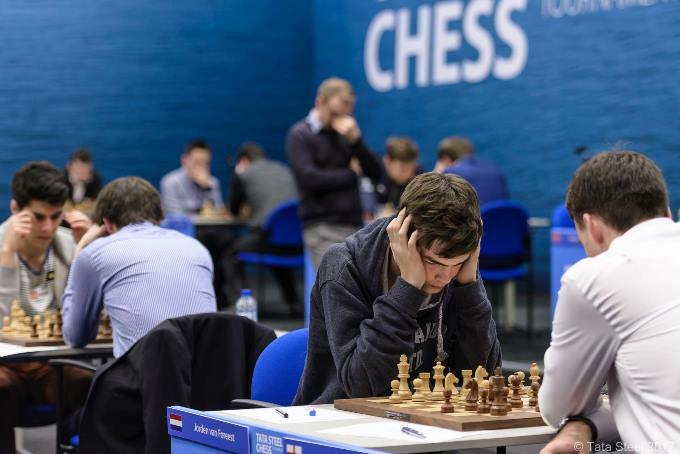 Usual favourites such as Ragger, Smirin and Xiong (2 losses, but 4 wins) won their games, while Gawain Jones showed the power of the queen and knight to squeeze out a fourth win in a row that condemned Jorden van Foreest to a fifth defeat. 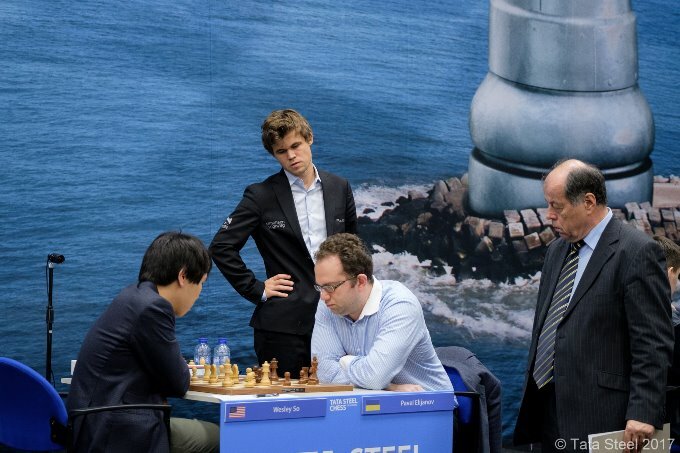 In Round 8 the game to watch may be Rapport-Carlsen, when Magnus will surely abandon (or be forced to abandon) his policy of taking quick draws with the black pieces. Karjakin-So, meanwhile, looks like a heavyweight battle. 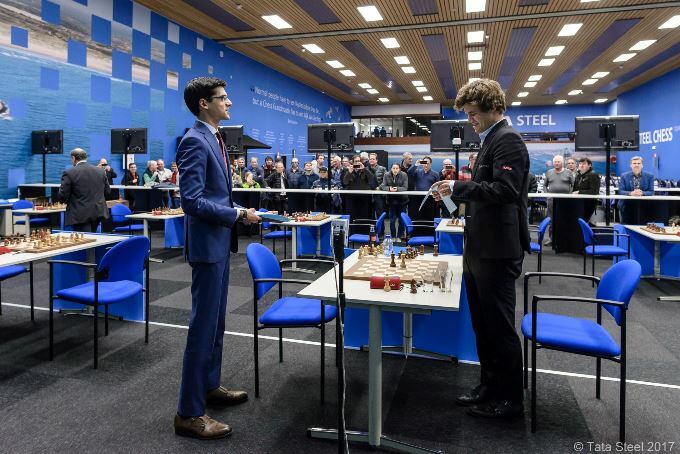 Tata Steel Chess 2017, 2: Magnus "hugely inspired"